The experience of a Blake Mills concert is something that cannot easily be described. Despite my best efforts, I will never be able to properly convey what seeing Blake Mills live entailed. A few years ago, I attended a concert at the World Cafe Live Upstairs in Philadelphia. If you have not had the chance to see a concert there, I suggest you put in your best effort to get there at some point. The venue encompasses all the qualities of being intimate and relaxed, yet is a powerful and acoustically impressive venue. However, the show room Downstairs at World Cafe is something I had not experienced until a few nights ago. From this point on the Downstairs will serve as my venue of preference. The room is slightly larger and more spacious than the upstairs, but still retains an intimate, friendly feeling. It feels similar to the small, dining establishments that line the streets of New York City. It presented the perfect stage for an incredible night. yMusic, a six piece ensemble served as the opening act. In and of itself, their performance would have been enough. Violinist Rob Moose provided strings for Blake Mills’ newest album Heigh Ho, and has also performed with many other artists including St. Vincent, Bon Iver, and the Punch Brothers. The group melded violin, viola, cello, clarinet/bass clarinet, flute/piccolo, and trumpet to capture both modern and classical sounds alike. One particular piece, “Music In Circles” sounded eerily similar to the sounds introduced by trailblazing composers like Philip Glass and Steve Reich. It was euphonious. It was movingly beautiful. When Blake Mills finally came onstage, I was surprised by his introverted demeanor. I was not expecting an overly talkative and outgoing performer, but I also was not expecting him to seem so shy and humble. Accompanied by his four piece band, he immediately jumped into “If I’m Unworthy” from Heigh Ho and continued into “Hey Lover” from his debut album Break Mirrors. His passion was apparent, but his talent was overwhelming. An unexpected surprise was Blake straying off course down paths of improvisation and elongated guitar riffs. He appeared to just allow the music to overtake him. I felt I was witnessing a private moment. It was absolutely fascinating and captivating to see such talent and such love for music pour from one individual. Going into the show, I was aware of all the praise Blake has received over the past few years. He has been highly sought after as an in-studio guitarist for artists including Neil Diamond and has been likened to and praised by Eric Clapton. After witnessing him play in person, I realize none of those words even came close to accurately capturing his abilities and talent. I must also applaud his band, for improvising along with him, always closely watching for a slight nod of the head, indicating a wrap-up of a brilliant tangent. About midway through the show Blake welcomed Fiona Apple to join him for three songs. Blake and Fiona toured together this past year, but it was an incredible surprise to have her come out for this show. Together they sang “Seven” and “Don’t Tell Our Friends About Me,” both songs were recorded with Fiona sharing vocals. Their vocal blending was spectacular. Somehow they were able to make two very powerful and unique voices meld together to form one mellifluous cross-harmony. In yoga pants, a t-shirt, and a sleeveless zip-up, there was something extremely endearing about Fiona Apple, and something extraordinarily charming about Blake and Fiona together. What was the most intriguing throughout the evening was seeing the way everyone who walked on the stage stared at Blake in undoubted admiration. They were enchanted by him. Fiona, his drummer, his keyboardist, all followed his fingers rushing up and down the frets of his guitar with such concentration. Later on in the show, yMusic came back onstage to accompany Blake on “Three Weeks In Havana.” The blend of orchestral voices, guitar, heavy percussion, keys, steady bass, and Blake’s vocals were nothing short of perfect. On occasion he would take a long enough pause in between songs to show his appreciation. On several occasions he referenced how the only people who come to his shows are other musicians and how much he appreciated the support of his band. It was really, really special. It is hard to think that the night could get any better, but in a complete surprise, Blake welcomed Jackson Browne to the stage. Blake relayed a story that at his high school graduation, he had performed “These Days.”. Jackson Browne and Blake then went on to perform the hit. It appeared a last minute encounter. Blake explained that Rob, the violinist, created a string piece for “These Days” in the few hours between sound check and the show. It was also Jackson Browne’s birthday, but I think the ones celebrating were the shocked and elated audience members. For younger readers, if you are unaware of Jackson Browne , please look him up ( I suggest “Stay” or “Running on Empty”). He has sold over eighteen million albums in the U.S. and has been inducted into the Rock and Roll Hall of Fame. He truly is iconic and this performance was one of a kind. The concert, which lasted over two hours, flew by in what seemed like two minutes.A perfect evening. If I could, I would watch it all over again. 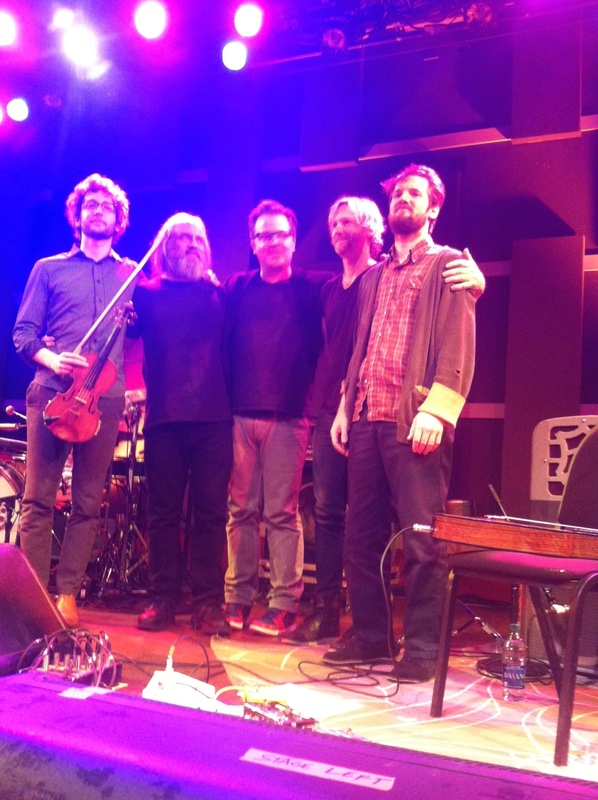 This entry was posted in Uncategorized and tagged Blake Mills, Concert, Fiona Apple, Jackson Browne, Live, Music, Philadelphia, Rob Moose, World Cafe Live, yMusic. Bookmark the permalink.